Great developments in printing throughout the second half of the 19th century meant that more printed material was produced than ever before. A concerted drop in the price of paper led to the cheaper production of periodicals and magazines, providing affordable volumes for the middle and working classes. 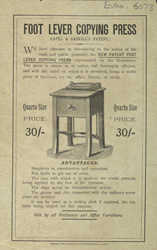 Machines like the copying press advertised on this leaflet would have been very popular with small industry.